The future can often disappoint (hoverboards, really? )—but the airships of the future definitely live up to their name. Also, they are here now. In late March, Straightline Aviation, an international airship company headquartered in the U.K., signed a letter of intent to purchase 12 Hybrid Airships designed by Lockheed Martin's top secret Skunk Works division. Valued at around $480 million, the deal could represent a watershed moment for an industry that is steadily gaining momentum after nearly a century of abandon. These modern airships are a far cry from the zeppelins of yore though—for one, they rely on helium rather than hydrogen for their buoyancy. This eliminates the explosive risk that became all too real with the Hindenburg disaster over New Jersey in 1937, which killed 36 people and put an abrupt end to the first airship era. Rob Binns, CEO of Hybrid Enterprises, Lockheed Martin’s newly established sales and marketing wing for the airships, told me that while these initial airships will be used for hauling up to 23 tons of cargo to remote places without roads—often for fossil fuel exploration—that in the future the football-field length vessels could be deployed for anything from humanitarian relief efforts to tourism to mobile hospitals. With enough space for 19 passengers, LM's Hybrid Airships travel at about 70 miles per hour. The Hybrid Airship is an energy efficient and environmentally friendly way to such destinations. 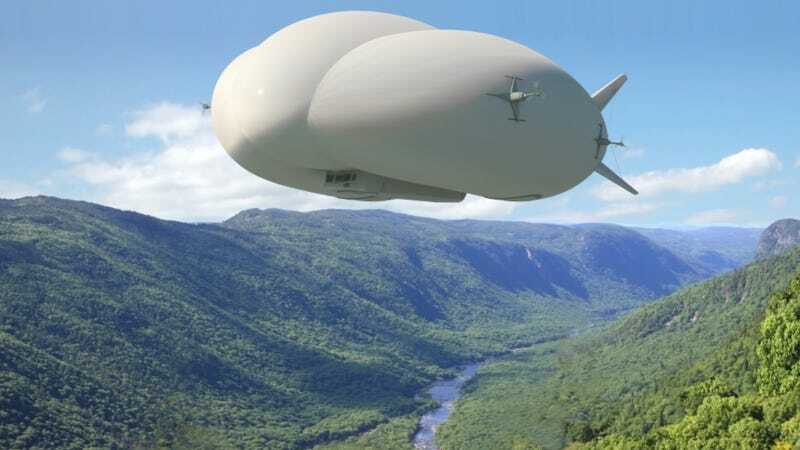 Binns also said that the airships will drastically reduce local environmental impacts in remote areas with little existing transportation infrastructure. "The Hybrid Airship is an energy efficient and environmentally friendly way to such destinations, with one-third the fuel burn and carbon emissions of a similar payload fixed-wing aircraft," he said. "There’s also less noise." The Lockheed Martin airships, like many modern models, are heavier than air and don't require mooring like traditional lighter-than-air aircrafts such as blimps. The standard definition of a hybrid airship is an aircraft that utilizes both lighter-than-air (LTA) technology and heavier-than-air (HTA) technology, such as fixed or rotary wings. Strategically located engines on the Hybrid Airships thrusts them into action and round, suction-like structures on their bellies allow them to hover over surfaces, including water, and to land without a runway. According to CNBC, this is the first time that Skunk Works, better known for creating military aircrafts like stealth fighters, has created something for the commercial market. Other large airship companies like California-based Worldwide Aeros Corp., maker of Aeroscraft airships, reacted to the Lockheed Martin deal with enthusiasm. "Although this deal signifies the contract between Lockheed Martin and Straightline Aviation, it's a welcoming step in the start of the emergence of unique lighter-than-air aircrafts that are capable of delivering valuable opportunities for the global logistics and aviation industries," said Worldwide Aeros Corp. CEO Igor Pasternak. Aeoscraft's Dragon Dream outside of its hangar. Pasternak said the while Lockheed Martin's non-rigid Hybrid Airship relies on "a combination of buoyant, aerodynamic, and propulsive lift," the Aeroscraft airship utilizes a rigid structural design known as "Aerostructure." Both aircrafts use inert helium for lift. While the Hybrid Airship holds around 23 tons, the Aeroscraft ML866 will have a payload of 66 tons—and plans are already in the works for models that can hold 250 tons and 500 tons, making them competitive with current shipping practices according to Pasternak. From an environmental viewpoint, Pasternak said that on top of the very low carbon profile, the airships are also able to circumnavigate the need to build new, resource-intensive infrastructure including roads, rail lines, ports, or even airports. When it comes to energy use, there is a catch: because of their ability to access remote locations, the airships will commonly be used to "increase oil and gas exploration opportunities" according to Pasternak. This could result in collateral environmental damage in the form of new pipelines, pump jacks, and the other trappings of the fossil fuel industry, not to mention the associated greenhouse gas emissions. On the flip side, the airships could also be used to benefit the clean energy industry. This is especially the case with wind turbines, which often have blades over 200 feet long making them very difficult to transport, especially to remote locations. However, as Clive Irving, an aviation writer, recently noted, even the most cutting-edge airships still have trouble navigating bad weather as their size and slow speeds make them vulnerable to high winds and other turbulent conditions. We will be seen as normal soon, although in five years time there will only be about the same number of hybrid aircrafts as there are currently blimps in the world. Chris Daniels is head of partnerships and communications for Hybrid Air Vehicles, a U.K.-based company focusing on lighter-than-air technology like the company's flagship Airlander. Hybrid Air Vehicles recently launched a crowdfunding campaign to raise around $715,000—a goal they met within 10 hours. Hybrid Air Vehicles has also been awarded over $3 million in funding from the EU's research and innovation program, Horizon 2020. Daniels told me that the crowdfunding has allowed Hybrid Air Vehicles to open up shareholding "of this amazing project to people who have been inspired by it." He said that the airship industry, which could become a $50 billion market over the next 20 years according one recent report, has plenty of space for two or more competitors and that the business is growing "in a similar way to how helicopters did after WWII." "We will be seen as normal soon, although in five years time there will only be about the same number of hybrid aircrafts as there are currently blimps in the world," he said. "But after that we feel it will accelerate away. We are market leaders, and feel we will consolidate this position as we’ll be the first to fly a full-size hybrid aircraft, the Airlander, very shortly." Daniels pointed out that the Lockheed Martin-Straightline Aviation deal is only a Letter of Intent, which is not legally binding. The first delivery of the Lockheed Martin Hybrid Airship is not expected until 2018. He said that eventually he expects Hybrid Air Vehicles' airships to have electric engines and possibly even flexible solar panels on the hulls. He said that while initially their aircrafts will likely be used for luxury tourism and leisure as well as search and rescue and other monitoring tasks, they could also be used for "long endurance academic research missions into climate change issues."